In the United States, the most commonly abused substance is also one that’s fully legal: alcohol. In 2014, Americans reported binge drinking in the prior month more than twice as often as they reported using any illicit drug. And according to a Gallup poll, 64% of Americans drink alcohol, a number that has remained relatively steady for decades. Yet the mass appeal of alcohol often hides its serious consequences, which can prove fatal more often than you might expect. As the term “intoxication” suggests, alcohol does in fact have a toxic effect on the body. Ongoing heavy drinking can lead to an extraordinary number of adverse health outcomes, such as chronic illnesses affecting several organ systems, mental health conditions, and severe alcohol poisoning. Using mortality data collected by the U.S. Centers for Disease Control, we’ve charted the number of deaths in the U.S. primarily caused by alcohol-related conditions, locating thousands of fatalities directly tied to drinking. Read on, and see how often the consequences of alcohol can take a deadly turn. In the past decade, alcohol has directly resulted in over 20,000 deaths per year from various health conditions. 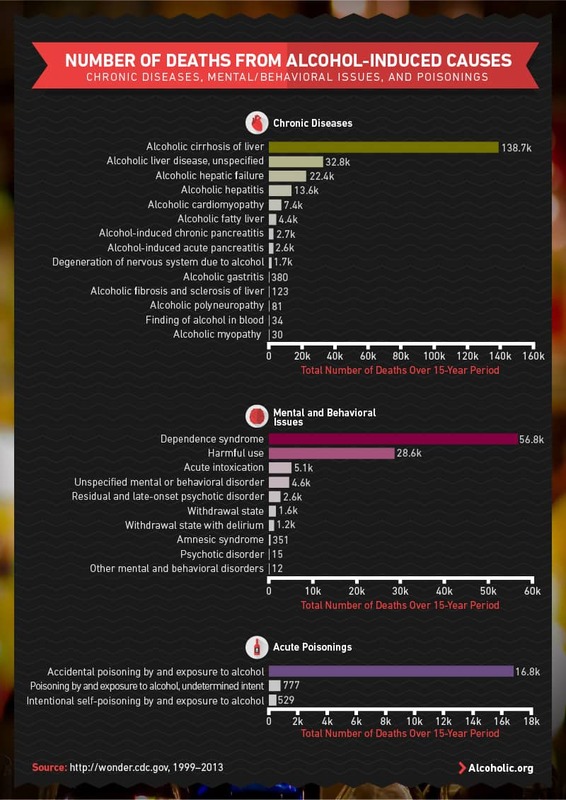 The vast majority of these were due to chronic diseases caused by alcohol. While the liver is one of the best-known organs affected by heavy or prolonged drinking, alcohol can also cause permanent damage to the heart, pancreas, digestive system, and nervous system. In second place, mental and behavioral issues linked to alcohol are ultimately responsible for the loss of thousands of lives yearly. These can include alcohol dependence as well as other psychiatric conditions stemming from chronic or severe intoxication. 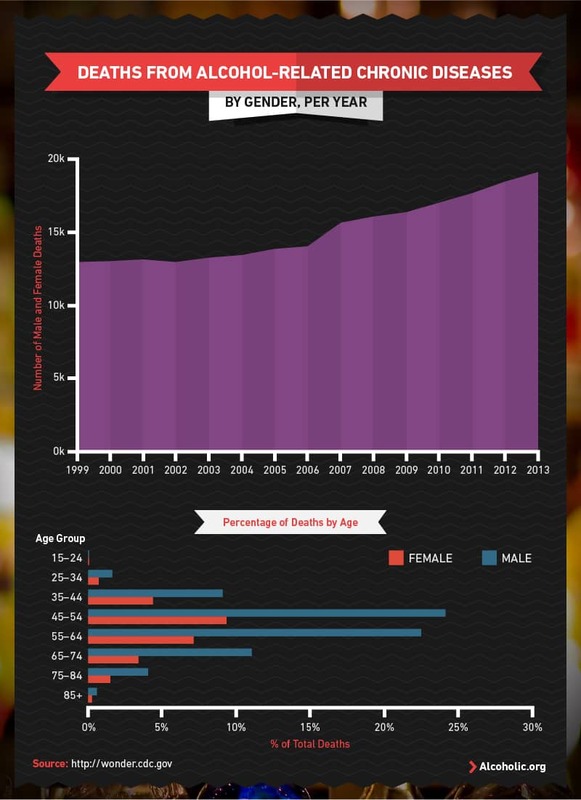 Notably, alcohol-related deaths have been steadily on the rise among all of these categories since 1999. Cumulatively, the increase in these alcohol-involved fatalities exceeds the growth of the U.S. population – meaning that such deaths are only becoming more frequent. 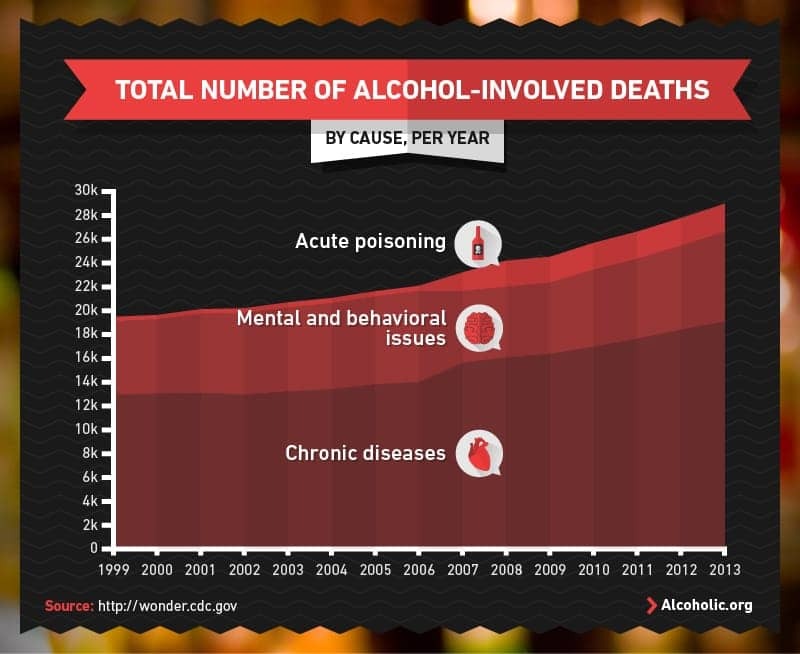 From 1999 to 2013, drinking has been responsible for hundreds of thousands of deaths in the United States. Among chronic illnesses, which comprise the largest category, cirrhosis of the liver has killed more than 138,000 Americans during this time. Cirrhosis is the result of cumulative damage to the liver leading to scarring and compromised liver function, most often due to chronic alcohol use, and can cause total liver failure and death. In the second-largest category, mental and behavioral issues, alcohol dependence syndrome was attributed as the cause of the vast majority of deaths. Alcohol dependence is a condition characterized by a strong and compulsive need to drink alcohol to the point that it interferes with everyday life or leads to health problems. A variety of deaths from psychotic disorders – conditions involving delusions and a diminished sense of reality – also implicated alcohol. Among deaths from acute alcohol poisoning, nearly all were due to accidental poisoning – more than 16,000. This was over 30 times greater than the number of alcohol poisoning deaths judged to be intentional. These data show that when individuals die of severe alcohol poisoning, it is nearly always unexpected. Over time, physical and mental health can decline when subjected to the cumulative ravages of chronic alcohol use, placing an individual in a variety of life-threatening situations. More acutely, alcohol poisoning serves as a striking example that the most serious of all health outcomes – death – can occur at any point of an individual’s dalliance with alcohol abuse. Alcohol abuse rehabilitation can help to halt the inevitability of these tragic consequences. Call 1-888-893-7018 to speak with someone about alcohol abuse treatment programs. While the trends over time for deaths from alcohol-related chronic disease show similar patterns of increase and decline among males and females, fatalities are overall far greater for men. 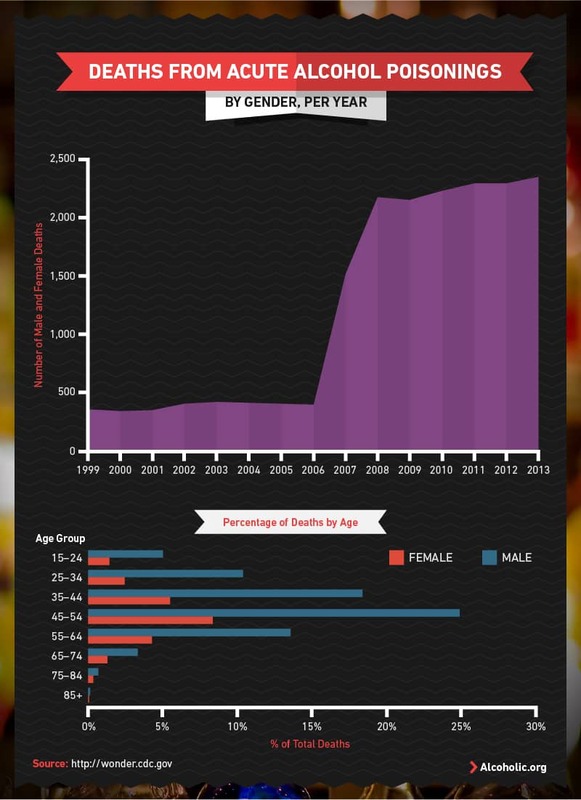 Of the more than 18,000 deaths in the United States in 2013, over 13,000 were among males. The gender-based disparity in these deaths is also reflected in differences in drinking behavior: In 2014, nearly twice as many men as women reported binge drinking in the past month. By age, alcohol-related deaths from chronic diseases occur most commonly among both men and women aged 45 to 54. These figures demonstrate that such conditions are hardly limited to old age – heavy alcohol use can ultimately take decades off a person’s life. Among deaths due to alcohol-involved mental and behavioral issues, such as alcohol dependence, similar patterns appear: Men are much more likely than women to die of these conditions, and deaths from such disorders are most common among those aged 45 to 54. Notably, this trend in deaths by age group persists even though alcohol dependence itself is most common among people aged 18 to 24. The gap between men and women may be explained by differences in how the metabolism of alcohol produces feelings of pleasure. A study has found that consumption of alcohol may stimulate a greater release of the neurochemical dopamine in men, potentially leading to an enhanced feeling of reward and a greater likelihood of developing alcohol dependence. Despite the demonstrable gender gap in the number of deaths related to alcohol abuse and associated mental/behavioral health issues, the fact remains that alcohol use disorder and its myriad consequences are problems with a heavy impact on everyone. If you’re experiencing the struggle with alcohol abuse firsthand, or if someone you love could use some help with problematic alcohol use, call 1-888-893-7018 – a compassionate member of our treatment support team can help with the process of finding substance abuse treatment to effectively address an alcohol problem. Alcohol poisoning can occur when very large quantities of alcohol are consumed rapidly, leading to vomiting, choking, irregular breathing, unconsciousness, and even death. More than 2,200 Americans per year die from the complications associated with alcohol poisoning. Certainly, binge drinking has a hand in these fatalities, as it places anyone at high risk for the above symptoms. While these deaths appear to have risen sharply from 2006 to 2008, this is due to a revision to the classification of alcohol poisoning deaths made in 2007. Historically, the hundreds of deaths attributed to alcohol poisoning per year were actually an underestimate. For thousands of Americans each year, having just one more drink may be the last thing they ever do. Overindulging in drinking may seem harmless at the time; however, for tens of thousands of Americans each year, what’s seen as a common pastime fuels an insidious progression towards substance dependency, chronic illness or even an abrupt death. If an alcohol problem is weighing on you or someone close to you, actively seeking help can be the crucial turning point. Alcoholic.org presents helpful information about alcoholism, alcohol detox, rehab and recovery. Fill out our contact form or call our confidential, toll free number to further investigate your treatment options. Call 1-888-893-7018 for more information. We used the U.S. Centers for Disease Control’s WONDER Compressed Mortality File to locate alcohol-related deaths from 1999 to 2013. Using ICD-10 codes, we selected deaths for which the underlying cause was physical illnesses related to alcohol (E24.4, G31.2, G62.1, G72.1, I42.6, K29.2, K70.0, K70.1, K70.2, K70.3, K70.4, K70.9, K85.2, K86.0, R78.0); mental or behavioral disorders linked to alcohol (F10.0, F10.1, F10.2, F10.3, F10.4, F10.5, F10.6, F10.7, F10.8, F10.9); or alcohol poisoning (X45, X65, Y15). 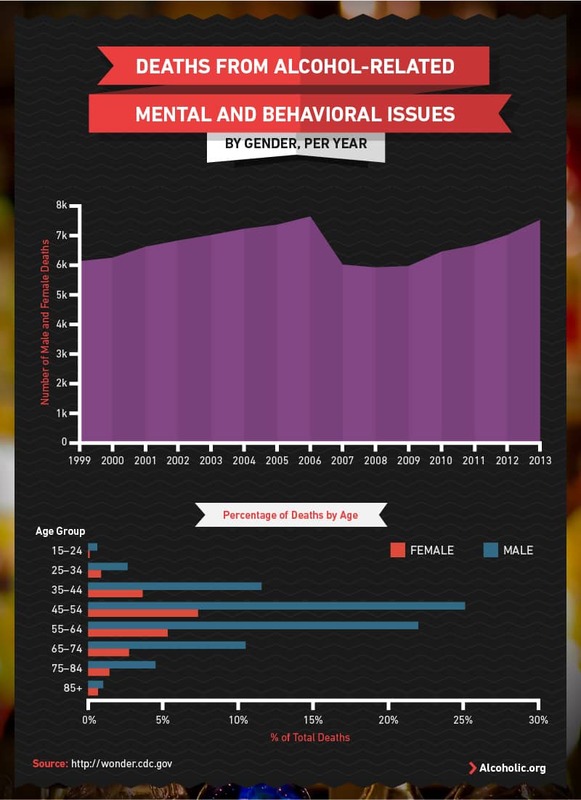 For bar graphs of age group and gender, each sub-group’s percentage was calculated as their fraction of the total deaths from alcohol-related physical illnesses, mental/behavioral disorders, or alcohol poisoning from 1999 to 2013.